Rare, Wild and Free is a testament to the work of one of the finest nature writers Britain has ever produced - Mike Tomkies, who spent 35 years in the wildest and most remote places in Scotland, Canada and Spain to study and photograph the rarest and most dramatic wild creatures. The eminent critic J.N.P. Watson commented in Country Life, 'Mike Tomkies is Mowgli, Robinson Crusoe and Konrad Lorenz rolled into one, a field of exceptional and practical knowledge'. Twenty years ago his zoological and biological peers also thought highly enough of his work to award him an Honorary Fellowship of the Royal Zoological Society of Scotland. These judgements, and much other critical acclaim including praise from the Duke of Edinburgh, is fully borne out in Rare, Wild and Free, which is a distilled masterpiece of his finest writings and wildlife photographs from the 20 years he spent in the remotest parts of the Scottish Highlands. For all the time he lived without any modern convieniences such as electricity, and the only access to his homes was by a small open boat in all weathers. He put into practice his belief that to study rare wildlife better, one had to live close to the vital animal state oneself. Whether breeding wildcats, stalking them in the wild, looking after injured foxes, owls and badgers in his home, climbing the high hills after the red deer herds, feeding wild pine martens through his window, or spending thousands of hours in hides on precarious cliff ledges to gain insights into the secret lives of golden eagles, Mike often emerged with photographs of stunning urgency, honesty and naturalness. 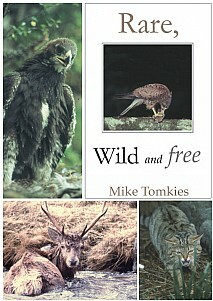 A superlative new book from Mike Tomkies, 'a field naturalist of exceptional perception and practical knowledge'. This is sure to delight not only Mike's numerous fans, but also anyone with an interest in wildlife and the natural world.